Why not make an impact with a stunning new bespoke Timber Front Door? 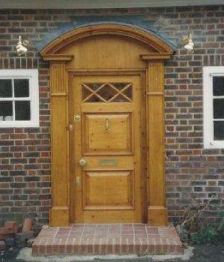 We make Timber Front Doors to suit your requirements and the period of the property and we have a wide range of Traditional and Contemporary Front Door patterns available for you to browse through. From Traditional Period Front doors with detailed moulded panels to contemporary Oak or softwood Front doors – the choice is yours. We can incorporate your new Timber Front Door into a Front Entrance Screen with sidelights or Porch – the options are endless. We can also make a new frame if required and hang the door into this supplying and fitting new ironmongery and fully paint finishing both. You may like some special leaded light or coloured glass in the door and we can provide you with many patterns and ideas.